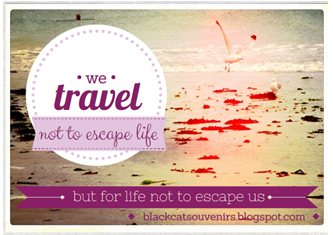 A black cat around the world: What do you travel for? I once read on the Facebook page of a friend something saying, more or less, "Instead pf dreaming about your next vacation, start building a life you don't want to escape from". Although this thing totally makes sense, in a way, and although I cannot deny I've been welcoming my travels even more than usual in certain peculiar periods of my life when I *just* needed to run away from everything for a while - I just cannot agree with this saying. I have this thing called travel-lust, which is like a sort of sickness: perhaps it has been latent for a while, during the very first years of my life, when all I was seeing of the outside world was the same ugly beach over and over again during summer holidays with my parents; but then it exploded the very first time I've started exploring the world, and it doesn't give me any rest - the more I see of this beautiful earth, the more I *want* to experience. Yeah, it's a sort of addiction - but one of the best kind: in fact it doesn't give dependency, but INdipendence. It doesn't have anything to do with how I feel about my life in general or with the will to escape from it: I lust after travelling when I'm sad, because it can provide me distraction, and sometimes even some answers I was looking for without even being aware; but I also lust after it when I'm happy, because travelling for me is a way to celebrate happiness - feeling in peace with the world and grateful towards it makes me even more willing to know it better. I want to travel when I'm bouncing with energies and when I'm tired; when I'm satisfied about my achievements and when I feel like total crap; when I'm in love and when I just want to forget everything; when I feel I need to move on and when I want to go back. That's why the quote featured in the picture is my favourite travel-related one: I couldn't agree more, and I think it provides the perfect answer to the forementioned phrase found on my friend's FB. Travelling is not escapism, it is discovering, it is knowledge. How could you escape life when life is just everywhere? How could you escape from yourself when you are the only compulsory luggage you must carry around? Life is always bigger than we think, with many more roads, paths and opportunities outside than what we could ever consider; and even ourselves - we are much more than we think. We have resources and strengths we would have thought of until we need to use them, and we have hidden talents that sometimes are able to come out only when we get out of our boxes. We can potentially become a different person than what we are now in every different place of the world than the one we are living in - because each place is a unique combination of factors and charachteristic that can unleash aspects of our personality so far unused, or enslaved by some habits where they cannot be exploited. Travelling not only makes us know more about the world, but also about ourselves. It broadens your mind and gives you freedom, by realizing that there's a huge bunch of differences outside. Differences might be scary at first, but fear only comes from what we don't know: travelling can provide you this knowledge, so that differences won't be seen any longer like scary, but like possibilities. But differences are also beauty - and here comes the other big point about the motivation for travelling. Knowledge, discoveries, freedom are basic issues, but beauty is always more immediate and never missing. Beauty hits you all the times, even when you turn your brain off, even when your soul is not open to learn anything - and so perhaps it is the most powerful force that can drag you along to wander the world. To see its beauty, to take a bit of it inside your heart, without actually stealing it, but exchanging it like an osmotic flow of energy. Beauty can enrich you and enlight you exactly like knowledge does, and actually most of the times they work in couple, like the two sides of medal - the rational and the emotive one. But I know - it just doesn't work this way for everybody. Once somebody told me he didn't need to travel, because he already had everything he needed here. Maybe I'm just not like that. Maybe my soul is just made of a different material: I can be happy, totally and sincerely happy of what I have - but still I always want more. I never can stand still, I always need to move, to try, to observe. I just *know* there is more outside, and I simply cannot help being curious to see it with my own eyes, feel it under my own skin. I guess there might be people who would be anyway unhappy wherever they might go, or people that can travel the whole world but without actually seeing where they are going, without gathering no real curiosity or enrichment from it. Being hit by the travelbug makes you restless, that's true. But I still see it as a blessing rather than a curse - because it can make you call yours the whole world, because it makes you see everything with curious, new eyes. Because it makes you not escape life, nor yourself. I do agree that, if someone is happy and serene within his own life, then he shouldn't criticize or dim other people's way of living, dreams and aspirations. We are all different and that's what makes the world interesting; so the only important thing I guess is that everyone can feel free to choose his own path, the one that makes him happy, without trying to change other people's minds and ways of being. Travelling broadens your mind and gives you the kind of knowledge that no book could ever give you. It's a totally healthy curiosity, because not only it enriches you, it also makes you more and more eager the more you get it. And it's what makes you move on!